Throw back the curtains and let in the sun! I love, love, love window treatments! Fabric just makes me happy 🙂 With the window as you canvas you can add color, texture, volume and couture tailoring that makes any room look like it is ready to walk down the runway. This is also one of the best spots to spend your design dollars. Window dressings do not get the same wear and tear as a sofa, so splurge on that sumptuous kelly green trellis, you will have it for a very long time! I will take simple linen curtain panels over a naked window any day…but what I really love is to add divine details that really dress the room. I love to do a scallop welt along the leading edge of panels — that is decorator speak for the inside edge of each panel, where the two panels would meet if the curtains were closed:) Another fave is to create a box pleat trim, using the same fabric as the body of the panel, to apply to the leading edge. It creates kind of a tailored ruffle. Oh….and I love a good tape trim. Even on a fabric with lots of pattern, the solid line of tape just accentuates the print! 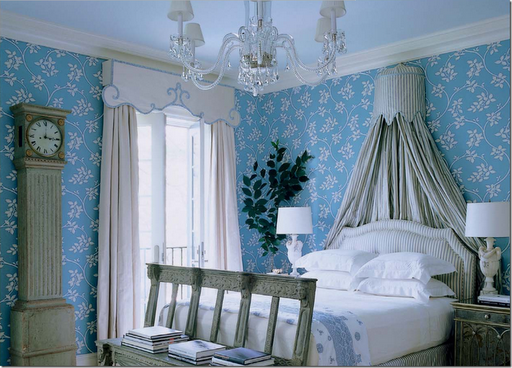 Another note for your little black book on decorating….It always amazes me how much window treatments soften a room. Clients often make the mistake of saying that they don’t want anything on the widow to take away from a beautiful view….that is such a mistake! Sumptuous window treatments are like a frame on a love painting, they make everything even more beautiful! Here are some of my muses….. Here is a serene bedroom I did with a scalloped edge on the windows. I love this! It looks like a fun ball gown.